Pastor Chuck O’Neal sometimes recorded private conversations without getting permission from involved parties. The elders were aware of this practice as you will read below. This was not a rare practice for him according to some people who personally saw this taking place. I’m wondering how many churches have pastors/elders who tape record conversations of their church members/attenders? Later, Meaghan added a followup comment sharing her experience with Chuck O’Neal using a recording device. Here is her story copied directly from the comments section. Meaghan’s story needs to be read. It is important and shows the type of treatment she and many others endured at the church, but was never able to share because of shunning. on January 1st, 2009~C’ON, DL and DW were on my front porch, there on the word of my new pastor to speak with me about my not submitting to them and causing discord with the flock…by the way, my pastor offered to sit ‘en masse’ with the several families at this new church to settle the disputes with Chuck, he refused. Instead came to my home unannounced with a recording device. I knew this because I didn’t open the door instead listened to their conversation via my peephole listening device. Heard DL say ‘Do you have the recorder on? To which Chuck said yes. When I didn’t open the door, they left only to return an hour or so later. Then we told them the police were called and to leave us alone, at which Chuck yelled all kinds of reviling remarks about us and they left. The police later spoke with Chuck and he told the officer he was given permission by our pastor to speak with us! The officer informed him only we could give him the ‘permission’ to be on our property and speak with us. Then Sept of 2010, after we returned a ‘family’ heirloom piano, of which we were only storing, the ‘church’, a mob of 30 or more, showed up on our front yard with the piano, all the while Chuck was video taping it. We didn’t engage, though it was very very sad and sickening to see the hatred in their faces~next day the piano was given away via craigslist to a very happy large family. God works wonders as painful as it was to see true colors. Since that day, I have been praying God will lead HIS children out of there, and give grace to those still there being blindly persecuted…may your day be filled with His love and grace. I am so thankful to God for leading us out, and when my eyes were opened, they were OPENED! This is just one of possibly many cases of using recording devices. I have talked with other sources who have confirmed that they saw him using recording devices during meetings and he did not disclose to the meeting participants that he was recording their conversation. Someone mentioned to me that they knew of a meeting in which Chuck played a recorded conversation that I was involved in. If Chuck had an issue with something that I said, why didn’t Chuck come to me personally? Why don’t I know about it? I wish I could hear this conversation. It feels very strange knowing that someone heard a private conversation of mine without my permission and knowledge. I am typically a very open person and what you see is what you get, but I like to share when it feels appropriate and safe for me. Knowing that something private was shared without my permission kind of feels like being stripped naked in front of a stranger – a very vulnerable feeling. It makes me wonder how many people were violated in this way. To me it is a violation of privacy to record someone’s private conversation. I also think it is wrong to take that recorded conversation and play it in front of people who were not privy to that conversation. It is wrong on so many levels. What would make a pastor stoop to such a level? 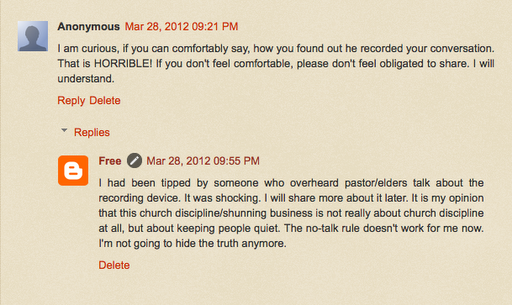 Why would a pastor have a need to record conversations? Why can’t someone’s recollection suffice? Why does he need “proof”? Are his witnesses (elders) not proof enough? Out of the 40+ yrs I have been going to churches, I’ve never heard of a pastor using recording devices to record his congregants’ conversations.It really is hard to wrap your head around this kind of thing. This seems like something one would see in a criminal tv movie, not a church, and certainly not from a loving shepherd. If you are going to Beaverton Grace Bible Church, you need to know that this may happen to you. If it happened with Meaghan and me, who knows how many others? Do you feel safe knowing that at any time your conversation may be recorded without your permission and played for others? Are you okay with that? A number of people have also told me their stories about recorded conversations, but I will not share them without permission. If you would like to add your story to the comment or send me an e-mail. I would be happy to feature your story. Weird! Of course, just like in authoritarian regimes, information is power. The discussion of recordings and misinformation put me in mind of the Nazi and later communist tactic of having neighbors report on neighbors, children report on parents, etc. Underlings are under constant pressure to provide information to those in charge in order to retain their favored status. Recorded conversations are a method of preserving such information. "all the while Chuck was video taping it. "Looks like he isn't just into tape recording.I know of at least one time he recorded someone without permission. What causes a pastor to behave so strangely? par·a·noi·a noun 1. Psychiatry . a mental disorder characterized by systematized delusions and the projection of personal conflicts, which are ascribed to the supposed hostility of others, sometimes progressing to disturbances of consciousness and aggressive acts believed to be performed in self-defense or as a mission. 2. baseless or excessive suspicion of the motives of others. While attending there I remember being shown videos of the pastor and associates trying to evangelize to Jehovah's witnesses and others. Some of these videos were previously available on the BGBC website. I wonder if the individuals in these videos gave their permission to be filmed and exhibited. I think not. I believe that they started taping these outings and got bolder and more aggressive about whom they recorded. I would also like to add that Tim had been released from the hospital only hours before the mob showed up with the piano. He had been in the hospital for 5 days. Our family had a very sleepless and tension filled week, only to be harrased by these people who we had praised and worshiped God together for 16 years. It truly was a heart ache for me to see the sheer hate in their eyes…very very sad. So let me get this right. You were storing a piano for the pastor at your house and after you left the church, you returned it to him. Pianos are crazy heavy to move and require a team of movers. I see your behavior as kind and gracious. You didn't have to give it back to him. You didn't have to go to the effort to round up guys to move it. I'm so puzzled by the behavior of the pastor/church, however. Their actions spoke louder than words: videotaping, 30 people to move one piano?? If it was a group of guys – say 4-6 guys – bringing the piano back to you, it would be one thing, but 30? Once again, this type of show in force is consistent with other patterns we have seen. I wonder what your neighbors thought of the pastor videotaping and 30 people present to move one piano? You really can't make this stuff up. It's sad. right around that, 2 vans and 3 cars load of people, quite frankly I didn't stand and count them. They also parked down the street, I guess to 'surprise' us…something I would rather forgive and forget. It was very hurtful, whether 30 or 3, the looks on the faces of people I had worshiped God with for 16 plus years was devestatingly hateful. And this too shall pass. I am grateful to God for sending a family who were very happy and blessed to take the 'heirloom' away and I didn't have to have the constant reminder of this man in my living room. Certainly also grateful to have that chapter behind me. Sometimes there can be a tendency to trivialize details like numbers and that is only a distraction to the real issue. You're so right, Meaghan, even if there were only 3 people, was it done in an attitude of genuine love and wanting reconciliation or was it done in spite? If there were more people than needed to efficiently move a piano, I would challenge the motives. I also would challenge the justification of a video camera. Why would this event need to be videotaped? Most people do not videotape events like this and it does raise some questions in my mind. quite a stark contrast to what it should have been, regardless of the number. When we were on the other end and needed a piano moved for us, we had no less than 6 – and more like 10 (way more than needed) strapping teenage boys from our church come and lovingly, cheerfully move it for us. and no one video taped it. The number is irrelevant. The attitude is everything. This is your concern out of this whole narrative? The number? Your all going to Hell lol. I don't think of going to hell as a laughing matter. You mention "Your all", who is that, exactly? It is sad, but I have to say, if they are commenting here, that means they are reading here 🙂 May they see the truth! And such poor grammar at that. If you are going to insult someone, whether it is in spite or in jest, at least use proper grammar. It should be, "you're all" not "your all". Sheesh! Someone done schooled you right, David. Well, she should have just openly turned the video camera on them. It's their property after all…tell these kinds you refuse to meet UNLESS the meeting can be recorded for everyone to hear. What causes a pastor to behave so strangely? A power trip! That would be a news story for sure. Julie I am greatful you are putting these stories out here. I hope the other members of his cult will take notice. Audio taping an in person conversation is illegal if both parties are not made aware of the recording. Excerpted from http://www.leg.state.or.us/ors/165.html Pay particular attention to paragraph C.165.540 Obtaining contents of communications. (1) Except as otherwise provided in ORS 133.724 or 133.726 or subsections (2) to (7) of this section, a person may not: (a) Obtain or attempt to obtain the whole or any part of a telecommunication or a radio communication to which the person is not a participant, by means of any device, contrivance, machine or apparatus, whether electrical, mechanical, manual or otherwise, unless consent is given by at least one participant. (b) Tamper with the wires, connections, boxes, fuses, circuits, lines or any other equipment or facilities of a telecommunication or radio communication company over which messages are transmitted, with the intent to obtain unlawfully the contents of a telecommunication or radio communication to which the person is not a participant. (c) Obtain or attempt to obtain the whole or any part of a conversation by means of any device, contrivance, machine or apparatus, whether electrical, mechanical, manual or otherwise, if not all participants in the conversation are specifically informed that their conversation is being obtained.